Are you working on enterprise level Java Project? Using Maven POM.xml file to keep all dependancies up-to date? In your project do you have src folder, resources folder, lib folder, etc? Well, what if you want to deploy this project to 3rd party client? Any other standalone hardware? Well, there is a simple way to build and create your Java Project’s executable with Maven Plugins. Take a look at below sample Java Project. 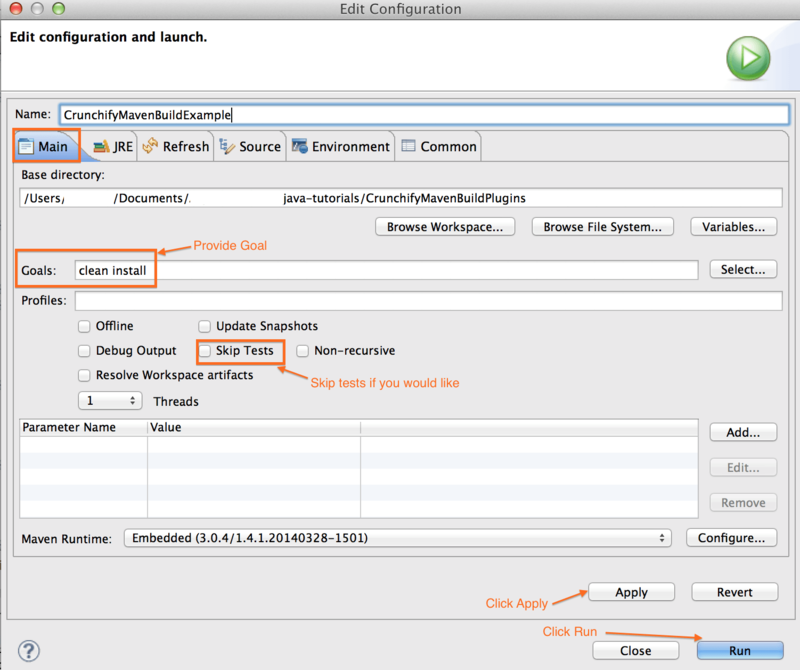 CrunchifyMavenBuildPlugins is a Maven Project. If you have Java project and wanted to convert it into Maven project then follow this tutorial. We do have two folders. src and resources. Inside resources folder we do have a folder called Scripts which contains one executable shell script file. 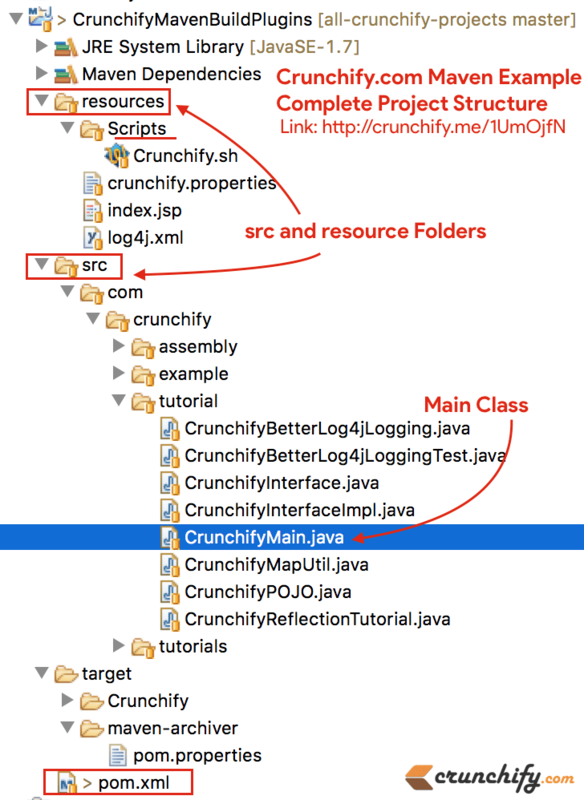 CrunchifyMain.java is a main starting point which has main(String args) method inside. pom.xml file in which we will add Maven Plugins which will build executable .jar project with all included dependancies. Open your pom.xml file and add below under <build>. Note: I’ve added 3 plugins below below. maven-resources-plugin: The Resources Plugin handles the copying of project resources to the output directory. The main resources are the resources associated to the main source code. maven-dependency-plugin: The dependency plugin provides the capability to manipulate artifacts. It can copy and/or unpack artifacts from local or remote repositories to a specified location. maven-jar-plugin: This plugin provides the capability to build and sign jars. Here is a complete pom.xml file. Mainly you would be interested in <build> tag. Please update directory location, filename and path as per your need below. You should see result something like this. Now check out the folder folder /target/Crunchify to check everything under that. Do let me know if you have any problem building project. Enjoy and Happy Coding. Why is the shell script inside resources? Because you can consider shell script as a resource to your project. I am getting a null pointer exception while following the same procedure. MY project structure has sr/main/resources. and Inside that directory there is a folder and inside that folder , there are 20 folder with each of them having 1000 files. Hi Sohil. Can you share detailed exception stacktrace? Without log it’s kind of impossible to debug further. Thanks. Hi Ipa – can you help share complete stacktrace? Can you share screenshot Devz? I think the behaviour you saw is because of some additional jar may present in your pom.xml file. What to add in com.crunchify.tutorial.CrunchifyMain if I dont have a main class in my project? helped me a lot, but is there a possibility to set some variables in resources according to the used build profile? Hi zlosim – that is possible. I’ll write a new tutorial on profiles which you could use with Maven build. Any ideas how to build the project into a Jar file, but package the Maven dependencies into a separate Jar file that can be shared with other projects? Good point but I’m not sure if it’s possible to share lib with other project unless you hard code common lib directory in all other project. I’ll look at this in details though. I have been dealing with this problem for a lot of days… THANK YOU VERY MUCH!!!! Awesome. Glad it worked for you Luisetelo.